Ogun State governor, Ibikunle Amosun, has confirmed visiting President Muhammadu Buhari in London where the Nigerian leader is currently receiving treatment for an undisclosed ailment. There has been controversy over a picture showing Mr. Amosun and the president in the United Kingdom, amid allegations an oldimage was edited to make it look recent. 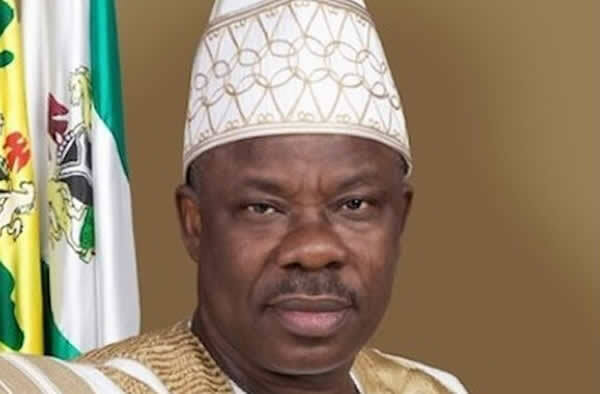 However, on Monday at an event at the Olusegun Obasanjo Presidential Library, Abeokuta, Mr. Amosun told journalists that he indeed visited the president in London. The event at the library was a climate change knowledge immersion workshop organised by the Federal Government inconjuction with the World Bank. “Yes it is true I visited our president in London and he is doing fine. If you ask me pointedly whether I saw him or not, yes I did and that is the only thing that I can say. And of course you can see he is very well, he is okay. So I don’t know what else you want me to say,” Mr. Amosun said.Asked of the condition he found the president when he visited, t‎he governor said he was not in the right position to talk about his health, saying such should be left to his spokes person who were already doing that. “I am not one of the spokespersons of Mr. President; so it will be out of place for me to talk on that. But then, they are doing their job and you’ve listened to all that they have said,” Mr. Amosun said.